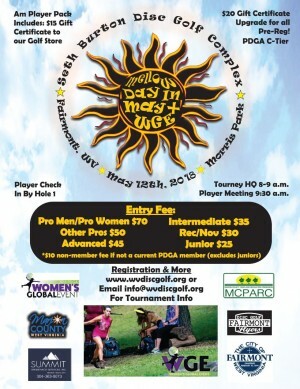 Come play in the First Sanctioned WGE in West Virginia!!! These ratings will be averaged to determine player's "Global Score"
used to determine the winner in each division and earn a memorable trophy. Note: If you register for the WGE day-of you will miss out on special prize packages leading up to May 12 through Facebook Contests and Sponsored Sweepstakes Giveaways. The Virtual Playerâ€™s Pack will still be available to players registering on May 12 with the link provided by the local WGE Tournament Director. Pre-register and we will increase your gift certificate to $20!!! Please Support Our Sponsors - Innova Disc Golf, City of Fairmont, Marion County CVB, MCPARC, Summit Brokerage Services and the Fairmont Flyers DGC!